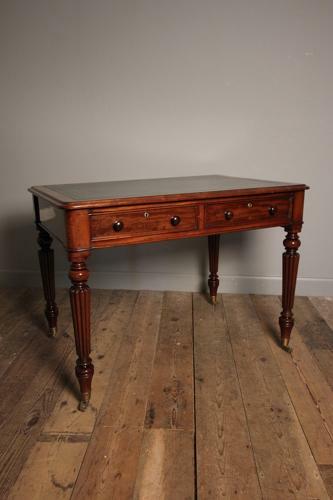 A high quality 19th century Mahogany library table of lovely proportions, with show wood to all 4 sides. Raised on tapering reeded legs, having 2 drawers both retaining the original handles, locks and escutcheons. The table with a moulded top and the original dark green tooled decorated inset leather. Superb colour and original finish throughout. English, Circa 1837. This table is stamped by T Willson of London. Thomas Willson entered the directories as a furniture broker and appraiser of 68 Great Queen Street between 1821 and 1829; he may also be the Thomas Wilson auctioneer recorded at 28 Little Queen Street 1799-1825. From 1830-1837 the Great Queen Street business was continued by Mary Willson & Son after 1838 it is listed at the same address as Matthew Wilson. Price inclusive of courier delivery within England & Wales. Dimensions: Height: 77.5 cm - 30 1/2 Inches, Width: 107 cm, 42 Inches, Depth: 75 cm - 29 1/2 Inches.